On May 14th, 2018, professor Sun Choi from Ewha Womans University visited our school and delived the “Pharmaron Lecture”. The title of Professor Sun Choi’s talk is “Molecular Modeling and Computer-Aided Drug Design (CADD) and their Applications to Drug Design”. Faculty members and students attended this award lecture and had extensive discussions with professor Sun Choi. The lecture mainly focused on drug research and development. . With extensive examples, professor Sun Choi introduced her researches in the area of chemical synthesis, biological assays and computational design of drug molecules. Drug discovery includes the target identification and validation, leads discovery and optimization, candidate discovery, pre-clinical and clinical trials. Molecular modeling and CADD facilitate the drug discovery process. 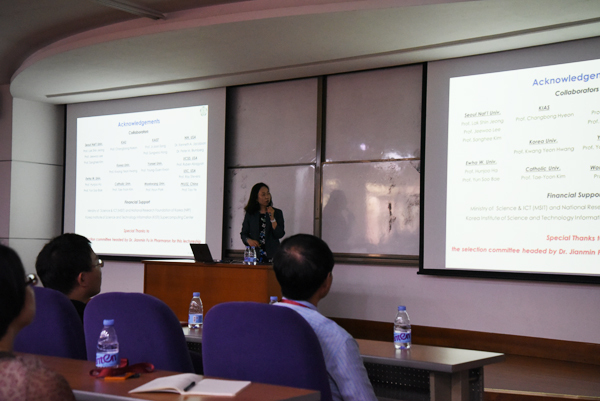 During her lecture, professor Sun Choi described how to apply a number of docking methods in the study of GPCRs (G-protein coupled receptor). Through the combination of multi-scale molecular dynamic simulations, big data analysis and machine learning technics, professor Sun Choi investigated the design of agonist and antagonist of the allosteric effect of enzymes. 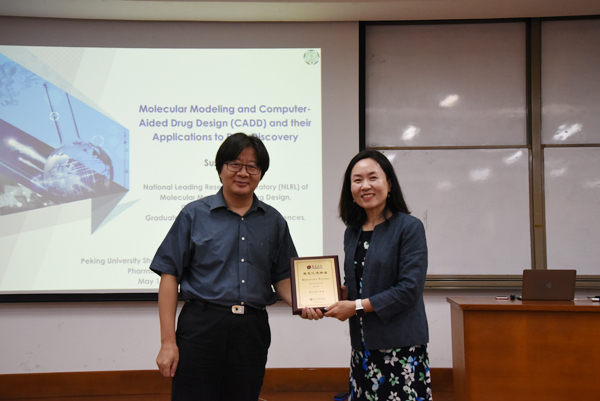 At the end of the seminar, Professor Tao Ye, deputy dean of our school presented the award plate to professor Sun Choi (as showed in the picture) . Professor Sun Choi got her B.S. at college of pharmacy, Ewha Womans University in 1987. She continued her Ph.D training at State University of New York at Buffalo in professor David G. Hangauer’s group and was horned her Ph.D majored in medicinal chemistry in 1999. Until 2001, she was a postdoctoral fellow in professor Richard B. Silverman’s group in the department of chemistry and the drug discovery program in Northwestern University at USA. After that, Sun Choi started her career in Tripos Discovery Research Ltd. as a research scientist. In 2005, she was back to Ewha Womans University till now. The research interests of professor Sun Choi includes: computer-aided drug design methods and applications, protein-ligand interaction and their mechanism of action, molecular design, combinatorial library design, virtual screening, drug discover research for various diseases in cell signaling, biomolecular simulations (protein motion and allostery), theoretical studies of enzymatic and chemical reactions, big data analysis and machine learning.